DSales (UK), the UK distributor for the Develop range of multifunctional document imaging systems, is celebrating a successful 2017. A particular highlight was the company’s move last spring to the purpose built ‘Business Hub’ near Halifax, with 15,000 square feet of space. This provides room for larger offices, premier showroom, technical training centre, PDI centre for setting-up and customising machines prior to delivery and a marketing department. The new warehouse allows greater stock holding and control of logistics of Develop machines and consumables. Also in 2017 DSales (UK) launched Develop’s new security service known as ineo SECURE UK, exclusively available from authorised Develop resellers. Highly trained professionals can configure the security features of Develop devices – either prior to onsite installation or at the users’ premises, customised to the individual user’s requirements. With the need for compliance with the new General Data Protection Regulations by May 2018, attention is focused on the need for data security, including print as part of the IT infrastructure. The growing need for document workflow solutions saw DSales introduce enhanced versions of exclusive software such as convert+share. 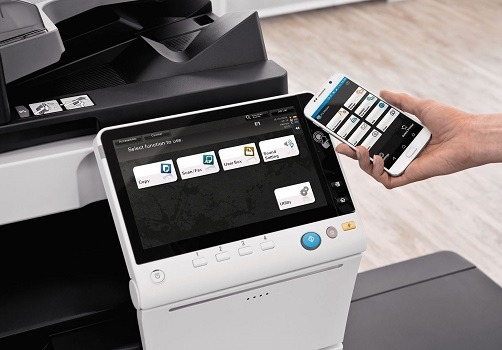 This does away with many manual document processes by allowing original documents to be scanned on a Develop MFP and automatically converted to many different file types that can then be sent straight from the devices to a number of destinations. Support for the rise in mobile working patterns was also provided by the award-winning app ineoPRINT, free to download for Android and iOS devices. The latest Develop ineo MFDs have a dedicated mobile touch area enabling users to easily pair their mobile device with ineoPRINT using NFC technology. They can then print documents straight from their smartphone or tablet or scan jobs to their mobile device without using a PC. Customers can also use ineoPRINT to store and manage documents in one place and access popular cloud storage platforms. DSales (UK) continued its corporate social responsibility programme with ongoing support for Joining Jack, a charity which aims to raise awareness and fund research into Duchenne Muscular Dystrophy. An additional highlight was the promotion of Huddersfield Town from the Championship into the Premier League as Develop is the Club’s Official Imaging Partner. Jonathan Whitworth, MD of DSales commented, “As well as a very successful year commercially, 2017 was significant in a number of ways for us, most notably our premises move which now allows us to hold our own stock instead of using third-party storage. We continue to innovate with developments such as ineo SECURE UK which sets new standards for print device data security. And we recognise the need to provide customers with software for total document management solutions and not just hardware.